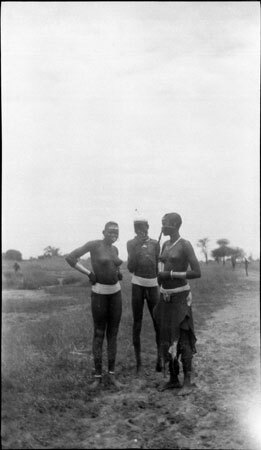 A Dinka youth stands with two young women, all wearing bands of beads around the waist, the women with large coiled metal armbands. Morton, Chris. "Dinka youth and women" Southern Sudan Project (in development). 03 Jan. 2006. Pitt Rivers Museum. <http://southernsudan.prm.ox.ac.uk/details/2005.51.319/>.